This acrylic painting was inspired by vintage postcards of Christmas carolers. The village surrounding them is from my imagination. 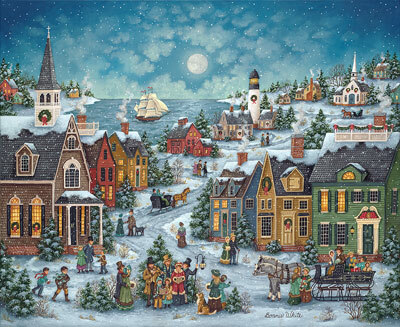 A full moon shines down on this little village as people begin to gather around a group of Christmas carolers. Snow flurries along with the wreaths and greenery that decorate homes create a festive atmosphere for the evenings festivities. To the left, two young boys, snowballs in hand take aim at the unsuspecting spectators that have gathered. Only the little girl in the green coat notices and hopes she won’t be too late when she calls out a warning.